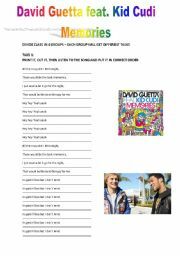 English worksheets: DAVID GUETTA feat KID CUDI ´MEMORIES´ ! !LATEST HIT!! Home > songs worksheets > DAVID GUETTA feat KID CUDI ´MEMORIES´ ! !LATEST HIT!! DAVID GUETTA feat KID CUDI ´MEMORIES´ ! !LATEST HIT!! LEVEL: elementary - intermediate 1 song and 4 different activities - divide students into 4 groups, give each group one task and listen to the song.